GIVEAWAY EXTENDED UNTIL JUNE 10TH! It’s been awhile since we had a giveaway here at Pedal Finder. The last one was in March when the good folks at Outlaw Effects offered forth a Five O’clock Fuzz. That was a lot of fun and now we are back at it again. 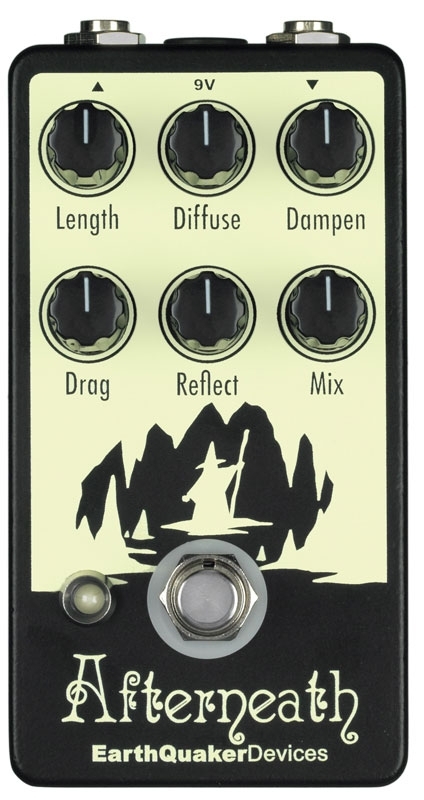 This time Pedal Finder is super excited to announce that we partnered with EarthQuaker Devices in order to giveaway one of their amazingly unique ‘reverberation machines’ – the Afterneath! If you’re a guitarist and you haven’t heard about the Afterneath, then let me be the first to welcome you to the internet. Take some time to look around. Once you’ve had your fill of cat GIFS make sure you come back, because you’re going to want to enter this giveaway more than once! Seriously, this is a pedal that has received a lot of well-deserved hype. This is a ‘none shall pass’ type of stompbox. Jamie Stillman is the idea man behind EQD. Like most builders, Stillman started out building pedals for friends and quickly turned to making pedals for those he didn’t know as well. That was in 2004. By late 2006, early 2007 he had his first pedals up for sale on the internet and things just took off from there with early productions of his more famous pedals. Marketing in those early years took place on forums and it wasn’t long that word of mouth made EarthQuaker a growing success. Now Stillman and his crew have a growing line of over 35 pedals that have brought a ton of accolades. Pedals like the new Fuzz Master General, the Bit Commander, the Arpanoid and the Disaster Transport just to name a few. Honestly, EarthQuaker has a serious ‘Midas touch syndrome’ going on that other builders are spending their days working towards. They also have really cool T-Shirts. How Does The Giveaway Work? As with all our giveaways this one is easy to enter. This time around, you don’t need to submit new pedals, artists or videos. Instead, we are looking for your pedal reviews. Every review you submit will get you one entry to win the Afterneath. What can be easier than looking down at your board and telling the world what you think about what you have on it? And, what about those pedals you got rid of? Let everyone know why it is no longer on your board and why it was replaced. You can do all of that at Pedal Finder. 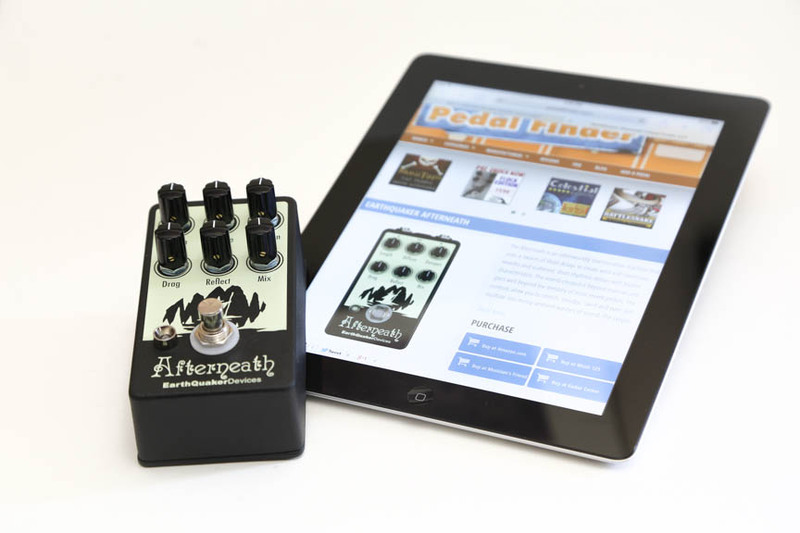 Just look for the pedals you have, visit the detail page and leave a review. It’s that easy! On May 27th at 2pm MST we will pick a random entry. We will email the random entry and they will have 24 hours to respond to the email to claim their new Afterneath. If the 24 hours pass and we don’t hear back, we repeat the process until we confirm a winner. This contest is open to everyone – even our visitors outside the United States. Don’t forget that you can enter multiple times. Review as many pedals as you’ve played. Did you run out of pedals to review? Get on down to the store and demo some and then come and tell us about it. Again, this specific giveaway is going on until May 27th (Wednesday) 2PM MST. IN ADDITION: If you like Pedal Finder AND EarthQuaker Devices on Facebook (and you win the contest) you’ll also get a slew of bonus swag from EarthQuaker including a screen printed tote, a pound of special EarthQuaker coffee, a poster and enough stickers to officially declare your love for EQD wherever you go. So it’s a no-brainer — like Pedal Finder and EarthQuaker on Facebook and get even more free stuff if you win. We even make it easy for you by providing the like-links below! Good Luck! Have Fun! I want and NEED this! RIGHT MEOW! 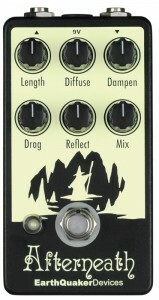 How beautiful the EarthQuaker “Afterneath” reverb/delay sounds. I find that most pedals that have too many configurations just seem to be cluttered and pointless. This pedal however, is not. You can easily find more than just a few sounds to suit both your studio recording and live gigs. And will also cover a vast variety of musical styles. Not only do their pedals sound fantastic, but the build it tough and graphics are very attractive as well! Very cool, and USA made in Akron, OH. It doesn’t get any better than this! Afterneath is warm as hell. With a lot of Dampen, this pedal can create amazing creepy sounds. Short reverb sounds sound great too. so sweet I am getting sugar rush ! love the video, would love one of these ! Wow… I’m going to review all my pedals, if necessary. I’ve heard nothing but good things about this pedal and love my organizer so…fingers crossed, good luck everyone! With this fuzz pedal you have all the functions of a dual fuzz. Smashing pumpkins,Foo fighters,Pink Floyd,White stripes,Black keys,White stripes,Black sabbath are just some of the tones I found with this pedal. I saw Andy from Proguitarshop.com do one of the best video demos I have ever seen on a pedal and I had to have one. It has been on my board since 2011, It is acually the only pedal left on my board that long. Keep it up Earthquaker….I am so Happy with this pedal. Take my advise…this pedal Rocks! Any news yet? Has the Winner been chosen?